There's some irony in the fact that the technological advantages the PC held over other platforms in the 1990s may have limited the longevity of some of its music. We had CD-ROM, hard drives, and discrete soundcards years before anyone else, and those advances pushed many studios toward not only full-motion video but elaborate, orchestral music rather than the chiptunes possible on the NES, SNES, and other sound palettes—a sound that has become a beloved aesthetic and genre in and of itself. 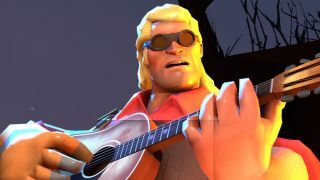 Nintendo’s (and even Sega’s) platforms inspire a ton of affection, but there’s still a lot of worthy professional and amateur PC gaming music floating around the web. Songe is an unbelievably talented multi-instrumentalist, mixing everything from flutes, drums, and ocarinas (when appropriate) to multiple guitars and piano, to his own vocal backing, like on his terrific takes on Warcraft II’s Orc theme or the Skyrim Dragonborn theme. Among his dozens of tracks, his Spelunky Mines Medley stands out as a reverent interpretation of a song heard thousands of times by any dedicated Spelunker. This rock-metal cover of UNATCO (the organization of which Deus Ex’s JC Denton is a member) was one of the favorite things I found online, mainly due to how restrained it is. So many of the metal covers of game music fall drift dangerously close to parody with over-applied kick pedaling and overlong guitar solos. Skilton keeps it simple here while producing an exciting take on what was a pretty sedate, austere tune originally. We really like Ben Prunty’s stuff around here—so much so that we asked him to compose an original song for our podcast—so it’s great to see an FTL track covered so well by Canadian guitarist James Mills. Give Mills’ System Shock 2, Hearthstone, StarCraft, and Dragon Age: Inquisition tracks a listen too. From the “Weird Al genre” we have this rap from Captain Spalding, a regular on the PC Gamer TF2 server circa 2008-2010. There’s an insane amount of Mass Effect covers out there paying homage to Jack Wall (and others’) incredible work. Sadly, an uncomfortable amount of it is dubstep. Tim Skilton’s take on the wonderful Suicide Mission theme isn’t, thank goodness. Danny Baranowsky is absolutely prolific, having most recently composed for musical dungeon crawler Crypt of the Necrodancer. With his style of mixing modern composition with instrumentation from the 8- and 16-bit era, it’s no surprise that Baranowsky got his start on OCRemix. Super Meat Boy remains his essential work and while the official Super Meat Boy album contains a bunch of covers, I love the official piano collection by Brent Kennedy, a 10-track set that can be had for $5. You won’t see X-COM getting a lot of recognition for its music in remixing communities, but this track from Fnotte manages to make something good out of the memorable intro sequence to UFO Defense.